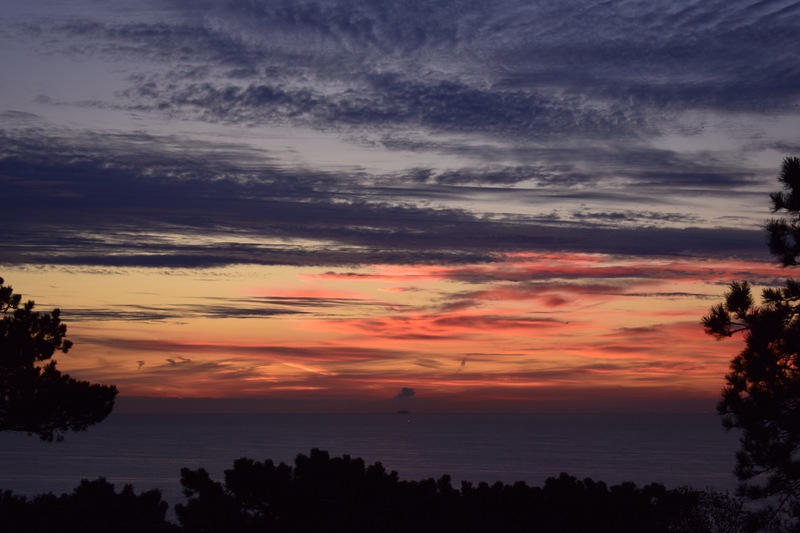 There’s something special about sunrises at this time of year – there is probably a technical explanation about the angle of the Earth’s axis but whatever it is, the colours seem more intense. 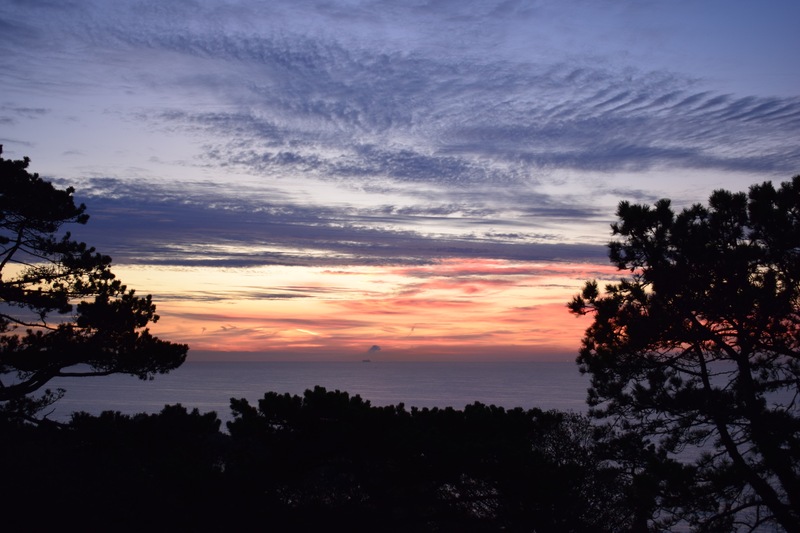 These photos were taken at 6.50am when our little patch of the world was bathed in a glorious pink-tinged golden light as the sun appeared then disappeared behind a blanket of cloud. 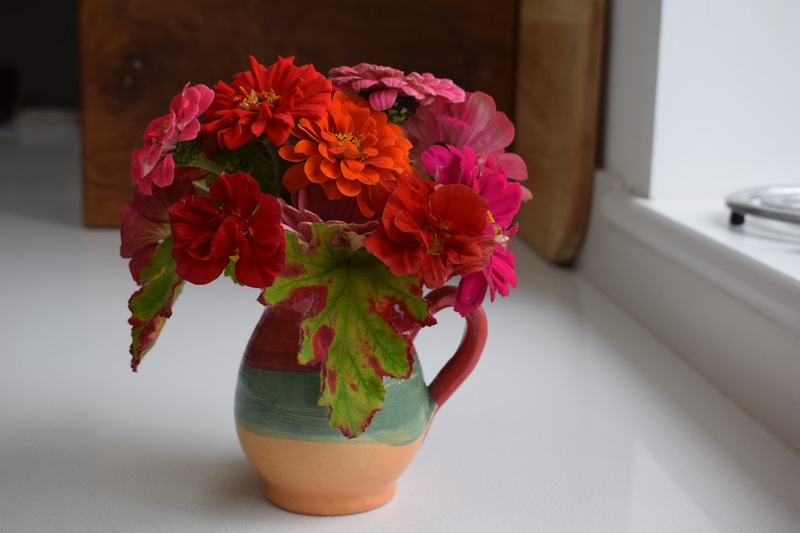 Tenuous link… There are still bright sun-filled flowers in the garden, most notably zinnias still doing their thing. They’re a little tatty from the wind, but valiantly producing powerfully coloured blooms. And the deep red nasturtiums seem unstoppable – they’re spreading and flowering all over the place and I’m happy to let them. I’ve cut a handful of these sunshine flowers to bring a little sunrise indoors. 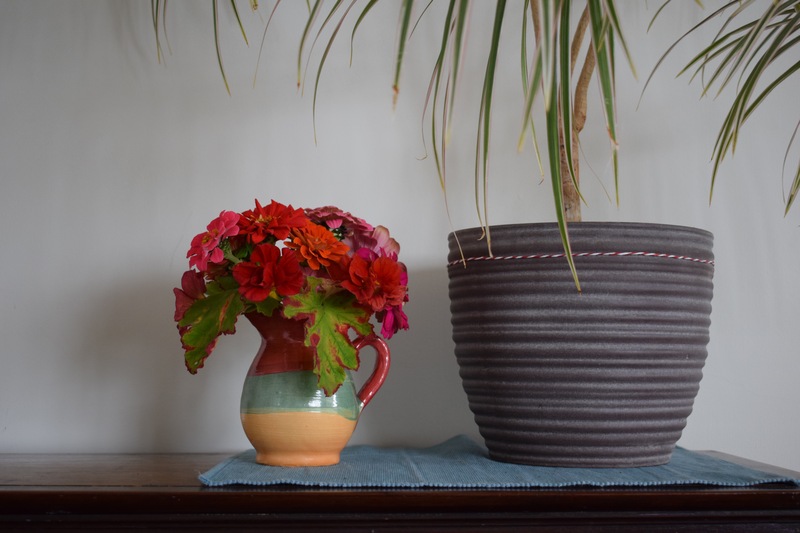 The red-tinged leaves are from Pelargonium ‘Attar of Roses’ and they smell delicious. 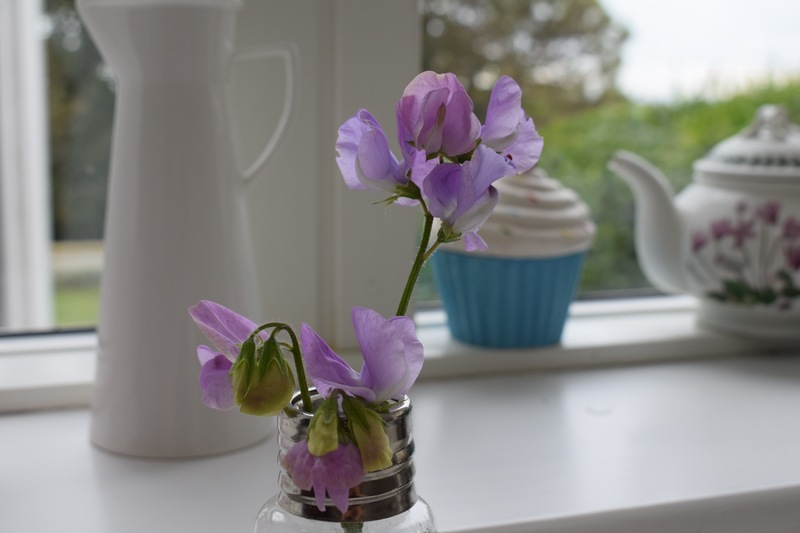 Astoundingly, I also found these sweetpeas on a plant that was destined for the compost heap. A last hurrah because it knows its days are numbered, perhaps. Cathy at Rambling in the Garden, who I’m sure you know by now hosts this weekly gathering of vases, has links to many others from around the world, so do go and take a look if you have time. Thank you for the insightful and encouraging comments on my last post. You are a lovely lot. Wishing you a good week ahead. You’ve certainly captured the sunrise in your bouquet! I admire nasturtiums’ optimism and zest for life! ‘ Attar of Roses’ is a lovely scented pelargonium. I haven’t noticed the sunrise around here since retiring I probably don’t get up early enough! There really is something especially nice about autumnal light. Nice that your garden is still producing plenty of cheerful flowers. We’ll take it while we can! 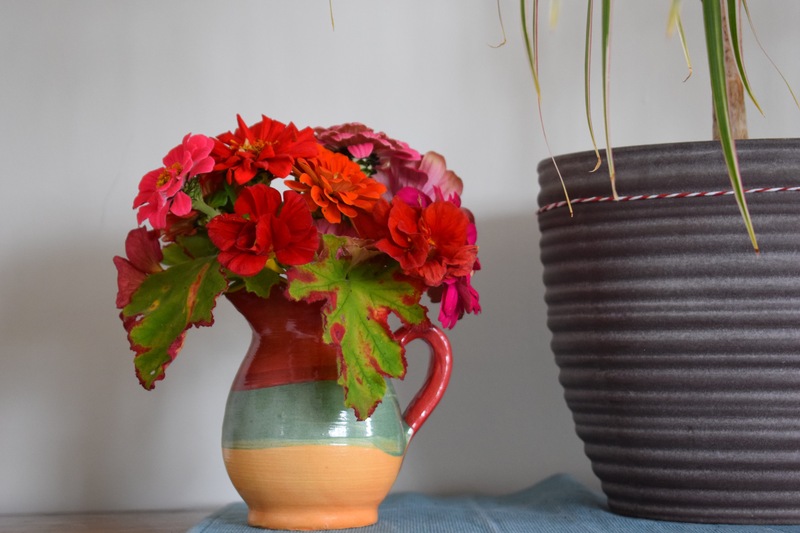 Your red-flower vase is perfection, Sam! 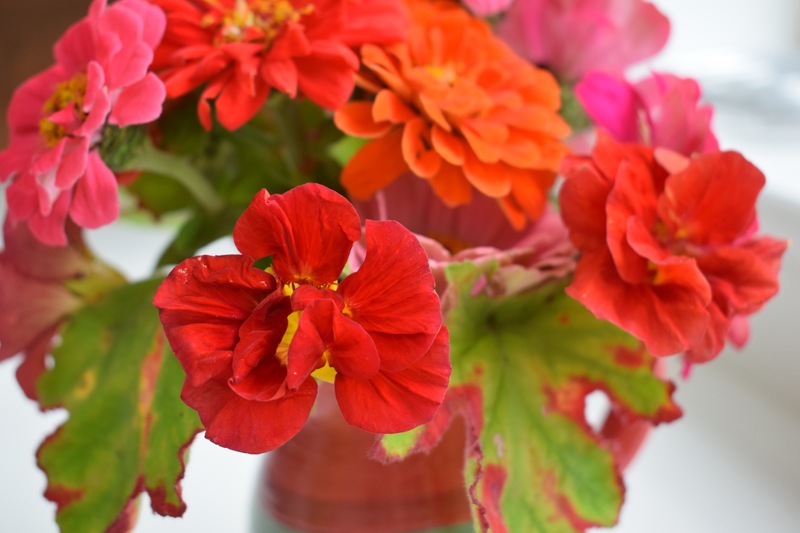 I’ve never seen that Pelargonium color up so prettily here – it was meant to accompany those flowers. The sunrise shots made a beautiful prelude to your vases. Lovely. We also seem to get the most spectacular sunrises here in October. Moonrises, too. 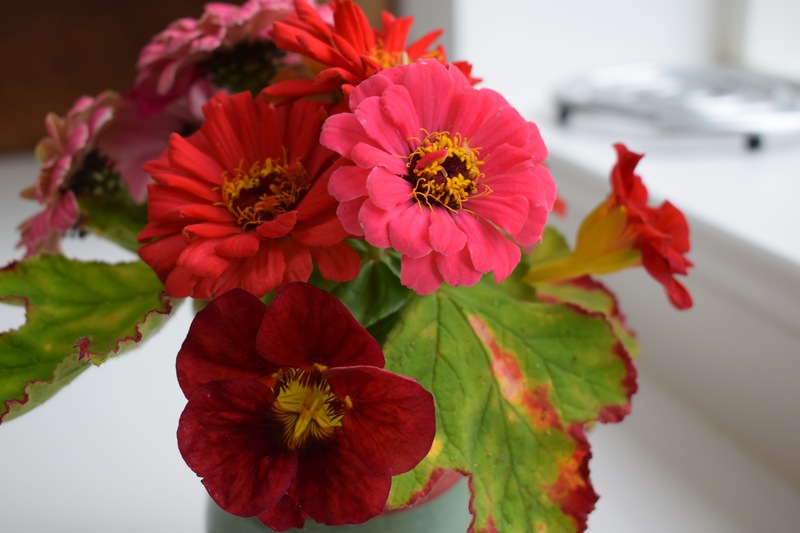 Wonderful Zinnias – I’ve pulled all of mine out of the containers so I can plant bulbs, but they were running down anyway. They’re on their last legs now! Oh, your photos are all just so beautiful! Thank you! Both lovely. 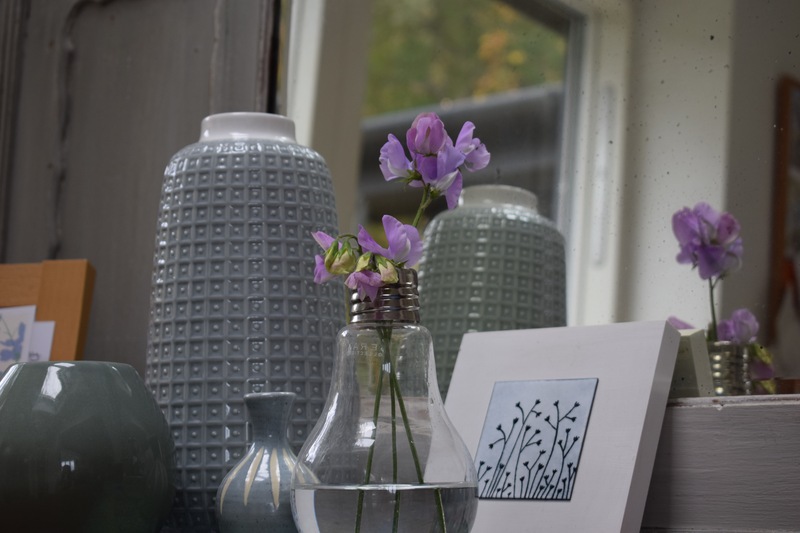 Is your vase for the sweet peas meant to look like an old-fashioned (by which I mean incandescent…not so old, really) light bulb? That’s really cute. Yes, it was a gift from a friend – ‘lightbulb moments’!